Norval Morisseau (1931-2007), also known by his Anishnaabe name “Miskwaabik Animiki” (Copper Thunderbird), has been the subject of many detailed recollections, national tributes, and personal remembrances since his death from advanced Parkinson’s Disease early in December. Some of the recent tributes on his life and work include statements from Assembly of First Nations National Chief Phil Fontaine, the Government of Canada, Toronto Mayor David Miller, exhibit curator Greg A. Hill, and obituaries from the New York Times, CBC, Globe and Mail, National Post, Toronto Star (P. Goddard), Toronto Star (B. Popplewell), and more. A synopsis of selected works from the retrospective is available from the CBC. The exhibit runs at the NMAI until Jan. 20, 2008, and is free to the public. 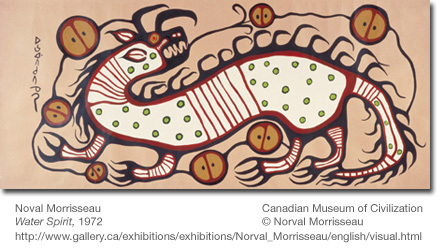 “Norval Morrisseau: Shaman Artist” Gallery links: National Gallery of Canada, National Museum of the American Indian, Institute of American Indian Arts, McMichael Canadian Art Collection, CBC Gallery Archive. Video Documentaries: “The Paradox of Norval Morrisseau” (1974), “The Colours of Pride” (1973), “A Separate Reality: The Life and Times of Norval Morriseau” (2005). “Copper Thunderbird” (by playwright Marie Clements): CBC review, National Arts Centre Performance Page. Lifetime National Aboriginal Achievement Award (2008), Order of Canada Appointment (1978). National Aboriginal Achievement Foundation: Norval Morrisseau to receive a posthumous Lifetime Achievement Award at gala presentation, March 7, 2008.